In the same vein as Marvel Comics Presents, this annual is actually a set of short stories, grouped together under the guise of a larger book. It’s a chance to get to know some of the members of the initiative without granting them their own title… or, really, even their own issue. 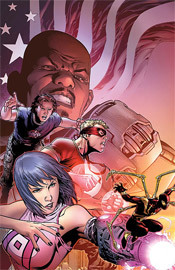 Dan Slott and Christos Gage share the writing chores throughout, but each chapter is handled by its own team of artists. Salvador Larroca’s artwork leads off with “Second Best,” a tale focusing on Gauntlet’s origins in the U.S. Army. As the first short story in the issue, it’s a great example of just how brief the narratives are going to have to be to fill the allotted space within this issue. Things are really just starting to get good when everything is jarringly drawn to a conclusion. Larroca’s contribution is par for the course as far as he’s concerned. If you’ve seen some of his previous work and enjoyed it, as I have, then you’ll continue to be impressed here. If his restrained, clean style didn’t float your boat in the past, well, he isn’t going to change your mind with this issue. In “Reason for Being,” Clayton Henry illustrates Armory’s awakening, of sorts. His work is a strong contrast to Larroca’s, only slightly more detailed but distinctly different. His efforts are much more cinematic, especially with the angles and page layouts he uses in this story. The second and third pages of this chapter are just tremendous, showcasing the artist’s knack for dynamic storytelling and detailed backdrops above all else. While Armory’s origin is shaky at best, he treats them with respect, and that heightens the impact of the story just by association. Steve Uy is in charge of the artwork for “Be All That You Can Be,” Hardball’s chance to shine. Uy’s work is heavily influenced by manga, which means his linework is very limited, allowing the book’s colors to handle nearly all of his shading. His style has its merits, but he’s also lacking in some fundamentals and his characters don’t have a lot of personality to them. While he seems to be striving for simplicity, he often over-works an area of the page that doesn’t really need the attention, while leaving more deserving sections unattended. That’s a shame, too, because while his artwork is probably the weakest of the issue, the story is among the best. MVP is the subject for “Born to Serve,” illustrated by Tom Feister and Carmine Di Giandomenico. While their style has some very rough edges, it also has moments of true inspiration. They seem to struggle with more pedestrian, conversational moments, which unfortunately fill the majority of their story, but really shine in the single page of action they’re granted. I fear they’ve allowed the odd, offbeat tone of MVP’s story to cloud their own efforts, because outside of that single panel, their work is very difficult to come to terms with. Finally, in “State of Readiness,” Patrick Scherberger is tasked with visualizing a day in the life of the Liberteens. His artwork is beautiful, a nice blend of J.Scott Campbell and Chris Bachalo, and he gives the characters an air of originality and electricity that helps the reader to overlook their horrible names and ridiculous attitudes. Outside of the artwork, which is light-hearted but gorgeous, and the surprise ending, this story is worthless. The stories all have their little consistencies, which gives the issue an underlying thread of connection and helps bring the six mini-stories together under a single umbrella. Obviously, the real goal here was to showcase a handful of the myriad of names and faces associated with the Initiative, and at that it succeeds. Borrow this from a friend. If you see a story or two that looks appealing, or a character you want to know more about, snap it up – at the very least, it’s a large book that doesn’t demand you read it in a single sitting.